It's a little joke, Happy birthday ! Thank you for the tag here angeltrish.deviantart.com/art/… and I accept to affiliate your group with mine . Maybe you are lucky and your group will be added to fayt journal. He behaved like he or his "friends" didn't see your group but one of them were complaining about your renders angeltrish.deviantart.com/art/… angeltrish.deviantart.com/art/… He blocked me too but I am curious to see if his "friends" (his accounts) will cry about my description in the comments. I am curious to see if he or "his friends" unblocks me to report my art or to read my description or other accounts of them to do this and so he can add the group in that journal. Or simply to log off and do this by himself. It was stated by Hideki Kamiya in an interview with My Nintendo News, that in the event that Bayonetta 2 is a success, he already has plans for a third title in the works. The series is likely to continue on the Nintendo Switch, as the popularity of Nintendos help with developing the second game likely will prompt them to keep hold of the IP on their systems. During its official announcement at the 2017 Video Game Awards, Bayonetta 3's initial teaser trailer was showcased. In an interview with Hashimoto, the director of Bayonetta 2, he stated he already had ideas in mind for a possible Bayonetta 3 and that it is something he'd like to work on. When asked by a fan what other hair styles Jeanne would look good in, Hideki Kamiya responded with "The answer will be in Bayo 3". In response to this Hashimoto tweeted he would like it if Dante could appear in Bayonetta 3. Bayonetta is an action-adventure hack and slash video game developed by PlatinumGames and published by Sega. The game was originally released for Xbox 360 and PlayStation 3 in Japan in October 2009, and in North America and Europe in January 2010. The game was later released on the Wii U alongside its sequel, Bayonetta 2, releasing in September 2014 in Japan and worldwide the following month. A port for Microsoft Windows was released in April 2017. A third installment, Bayonetta 3, has been announced for Nintendo Switch. Bayonetta takes place in Vigrid, a fictional city in Europe. The game stars the eponymous character, a witch who is capable of shapeshifting and using various firearms. She also possesses magical attacks, and she can use her hair to summon demons to dispatch her foes. The game features a rating system, which gives players a grade based on their performance, and a combat system that is similar to the Devil May Cry series. Development of the game was started in January 2007, with Hideki Kamiya being the game's director. According to Kamiya, the game was completely original, though he drew some inspirations from Scandinavian mythology, and played Devil May Cry 4 for reference. The game's theme is "sexiness", and that the characters were designed to be "fashionable". Kamiya and artist Mari Shimazaki spent more than a year to create Bayonetta's design. Several demos were released for the game prior to its launch. Bayonetta was the third project released by PlatinumGames, which was founded by former Clover Studios' employees. Upon release, the game received generally positive reviews. The game was praised for its combat, presentation and soundtrack, but was criticized for its story and quick-time-events. The game sold over 1.35 million units worldwide as of 2010, but Platinum was disappointed with the game's sales. The game was awarded and nominated for several end-of-the year accolades. An anime film adaptation of the game by Gonzo, titled Bayonetta: Bloody Fate, was released in Japan in November 2013. This group is for the people who support and like Bayonetta and dark brother Vergil, twin brother of Dante, from Devil May Cry. A fan club for the strangest pairing out there. For those who love Bayonetta and Vergil, or them together. 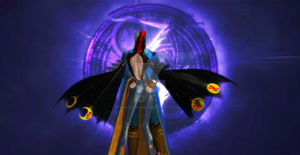 Devil May Cry/Bayonetta crossover pairing of Vergil, the Son of Sparda from Devil May Cry and Bayonetta, the Witch from Bayonetta. D'un point de vu scientifique un anniversaire est le tout premier jour d'un autre voyage de 365 jours autour du soleil ! Alors bon voyage et profite en bien ! En cette journée spéciale, nous célèbrons ta naissance et le bonheur de t'avoir parmi nous. Joyeux anniversaire ! Dis donc, tu ne nous as pas déjà fait le coup l'année dernière ? Allez bon anniversaire quand même ! "